A long-held axiom is that knowledge is power. Nowhere is this truer than when trying to determine how to resolve persistent resource overloads. But it’s hard to know how to address the constraints of your workforce if you don’t understand the scope and volume of work that’s competing for their time. This is why gaining visibility into demand is the starting point for any demand management and resource capacity planning endeavor. Establish a Sense of Purpose – Stakeholders may resist your attempts to inventory all demand. The truth is, it doesn’t have to be complicated, and in fact is best kept simple. Avoid resistance by communicating a strong sense of purpose, explaining that gaining visibility of demand is the first step toward greater agility and better decision making. Agree on a Clear Data Model – Part of the process of taking inventory of demand is grouping the projects into categories that will aid in prioritization. Multiple lenses and supporting data may be necessary, such as: business division, type of initiative, key benefit area, risk and benefit scores and metrics, and more. Go Broad, Not Deep – Resist the urge to capture too much information, focusing only on the data you’ll need to make tradeoff, priority, and staffing decisions. It’s more important to capture all demand that’s competing for your workforce’s time, even if the data is incomplete to start. Inventory All Current and Pending Project Demand – Once you’ve communicated the urgency and agreed on the data to capture, begin inventorying all current and pending project demand. It may be a challenge keeping it current initially, but soon it will be second nature. While a spreadsheet can be used initially, a PPM (Project Portfolio Management) tool will be needed, as it’s much easier to keep the data current, and everyone is working off the same playbook. Establish an Intake Process for New Demand – In addition to capturing the existing demand, you’ll need to establish an intake process for new demand. For requests under a certain threshold, the process can be streamlined, but all discretionary demand should end up in the same system, regardless of where or how it’s entered. Otherwise, you’ll only have a partial picture. Account for Non-Project Demand – Many organizations fail to account for non-project demand, such as general administration, small work requests, ongoing base services, and other work types. This work can take up a significant chunk of the workforce’s time, so it’s vital this is accounted for. Demand for this work can be planned on an average percentage basis and be captured via an annual project with buckets for the various types of work. Non-work time such as holidays, sick, and vacation time should also be accounted for in some way. Use a Strategic PMO to Drive the Process – A PMO can be a valuable champion for driving your company’s ability to balance capacity and demand. But to be effective, it needs to move beyond the traditional PMO model of being the methodology enforces and more as a vital enabler for aligning resources and work with strategy. Most organizations who have implemented these tips are surprised when they see for the first time where their resources are being applied and misapplied. Indeed, real capacity optimization begins with visibility of demand. It’s just a matter of getting started. 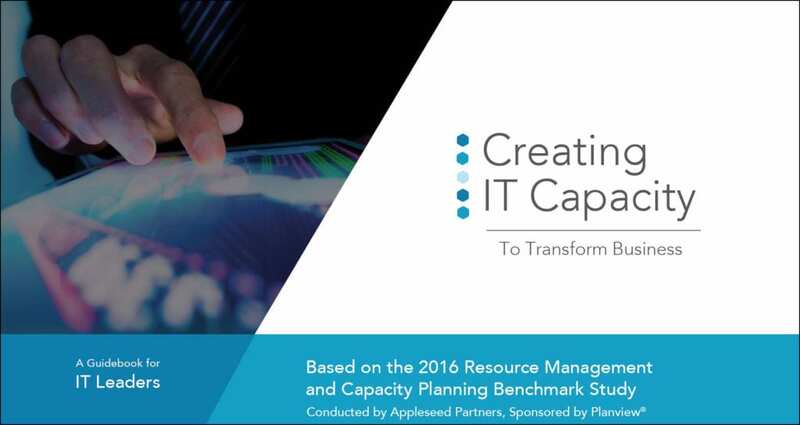 I invite you to read the the guidebook, “Creating IT Capacity to Transform Business” based on the 2016 Resource Management and Capacity Planning Study conducted by Appleseed Partners. Learn how your peers in IT are better able to manage shared resources, increase utilization and improve prioritization through the use of PPM. Jerry Manas is an internationally best-selling author, speaker, and consultant. He is frequently cited by leading voices in the world of business, including legendary management guru Tom Peters (“In Search of Excellence”), who often references Manas’s bestselling book Napoleon on Project Management for its insights on simplicity and character, and Pat Williams, Senior VP of the Orlando Magic, who called Manas’s book Managing the Gray Areas “a new path for leaders.” Jerry’s latest book is The Resource Management and Capacity Planning Handbook (McGraw-Hill), which Judith E. Glaser, noted author of Conversational Intelligence, touted as “the first book dedicated to what is essentially the drivetrain of organizations—the effective use of its people toward its most important activities.” Through his consulting company, The Marengo Group, Jerry helps clients maximize their organizational people resources, leading to a grater capacity to innovate, a more value-focused workforce, and an increased ability to adapt to change. He is a popular speaker at events around the world, speaking on lessons from history, resource planning, organizational change, and other topics. Jerry’s work has been highlighted in a variety of publications, including the Houston Chronicle, Chicago Sun Times, National Post, Globe and Mail, Huffington Post, and others.